Closed — One Year Anniversary: “Selene of Alexandria” Giveaway! It’s been a year since Selene of Alexandria came out. What a roller coaster ride! Before Christmas 2009, the first review came in from Bookpleasures.com saying “buy this now!” A handful of sales later, Story Circle Book Reviews (fiction for, about and by women) said “pure fiction magic.” The jewel in the crown, the Historical Novel Society said “a promising new historical novelist with a gift for wonderfully researched, vividly evoked, good old-fashioned storytelling.” More reviews, more raves. I could sit back and let the money roll in…NOT! Now I had to renovate my website, develop a blog, put together a press kit, create a book trailer, provide guest blog spots on other sites, leave useful information on historical and reading boards, conduct giveaways on reader sites, do public readings…and on and on. It was fun and exhilarating, exhausting and frustrating, but it was a journey that most writers would give their right hand for. I published a book. It’s out there and well received. Before I move on to publishing my second book Twilight Empress, I want to thank all the people who believed in me, bought and/or reviewed the book and recommended it to their friends. As a celebration, I’m giving away five copies of Selene. This is an international giveaway. For US and Canada winners, I’ll send either a paper book or ebook–your choice. For all others, I’ll send an ebook in your choice of formats. Entry is easy: leave a comment (make sure to give your email when asked, but not necessary in the post). If you want a second entry, sign up to follow the blog. For a another chance, repost this giveaway on your Facebook, blog, Twitter, website, etc. and post the link in your comment. Don’t worry if your comment doesn’t appear immediately. I moderate comments, so it may take little while! I’ll announce the winners on Monday, December 20. Again, thank you all and good luck! I’ve sent you each emails asking about shipping. Congratulations! Thanks for the chance to win. This looks like a good book. Don’t usually participate in lotteries and such, but can’t resist this one. Did post this on my blog ( http://cardioblogy.blogspot.com/2010/12/selene-of-alexandria.html ) as well as linking to it on my Facebook page (http://www.facebook.com/permalink.php?story_fbid=128460540548084&id=279201647&notif_t=feed_comment_reply#!/jens.fiederer ) for the extra chance. I’m commenting for the book 🙂 I’m curious about it! Congratulations, you’re a winner! I’ll be in touch about shipping. Thanks for participating! Let me throw my hat into the ring 🙂 I’d love a copy. Splendid of you to do the giveaway, Faith. You won the book! I’ll be in touch about shipping. Thanks for participating! Sounds like a great story! Thanks for the chance to win….it being an international draw and all. Plus, now that we have an ipad, I can read ebooks! Hello! I’d really love to read your novel, especially since I am currently working on a world archaeology course. The subject is very interesting, and I have the chance to be able to visit local digs and Roman archaeological sites nearby (Evreux). But it WILL eventually be mine. After all, I have a wedding anniversary this winter, too. on December 8, 2010 at 10:38 pm | Reply Mary K. from L.A.
I’ve had this on my TBR list for awhile now but haven’t gotten round to buying it yet (soooo many books on Mount TBR it’s hard to keep track). It looks so good! I’d love to have the chance to win it for my Kindle. Thanks for the chance! on December 8, 2010 at 10:41 pm | Reply Mary K. from L.A.
Oh, forgot to mention that I’ve just subscribed through the RSS feed, and I’ll mention your giveaway on my blog. Your multiple entries paid off! I’ll be in touch about shipping. Thanks for participating! This book sounds great. I’m actually reading Cleopatra’s Daughter, by Michelle Moran, which is about a Selene from Alexandria, living in Rome. Michelle’s great! I’ve got Cleopatra’s Daughter on my TBR list. 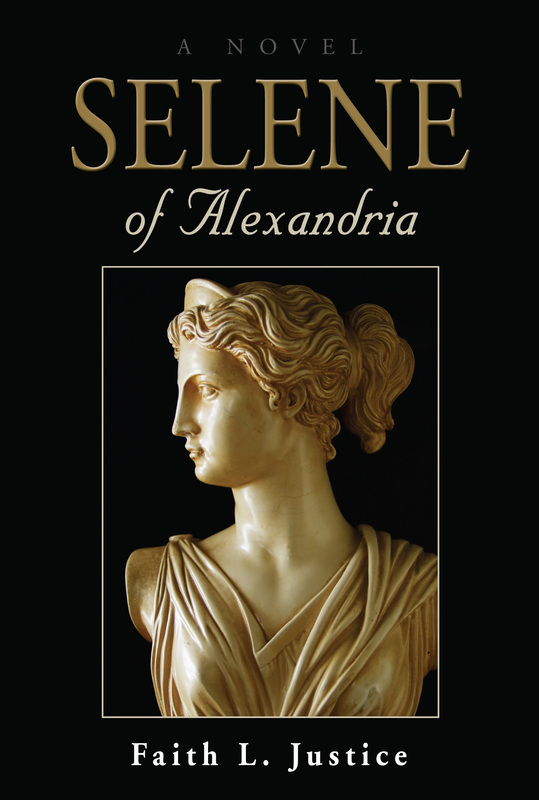 Her Selene is Cleopatra Selene II daughter of Mark Antony and twin to Alexander Helios. Their mother named them for the gods of the sun and the moon. Hope you like it! You’ll get to add Selene to your TBR pile! I’ll be in touch about shipping. Thanks for participating! I started reading _Selene of Alexandria_ this past Sunday and had finished it by late Monday evening – I couldn’t put it down! Looking forward to your next book. I just posted a review to Facebook’s “Living Social” app ( http://apps.facebook.com/facebookshelf/books/200004031116-faith-l-justice-selene-of-alexandria?alt=SELENE%20OF%20ALEXANDRIA ) and I also posted it to amazon.com. Thanks so much for the lovely review, Kim! I didn’t even know about the Facebook app. So much social media…so little time! I’ll be sure to let you know when the next one’s out. I would love to be entered for this book. I love novels set in that part of the world and in ancient times. I tweeted about this giveaway http://twitter.com/dolleygurl/status/15554560080744448. And I also subscribed via the RSS feed at the top. Now off to check out the posts about Agora! Hope you enjoyed the posts on Agora. Now you’ll get to see how I treated Hypatia in my book! I’ll be in touch about shipping. Thanks for participating! I’d like a copy if I’m lucky enough to win! on December 20, 2010 at 11:36 pm | Reply Mary K. from L.A.
Hey! That is wonderful news! Thank you so much, Faith! I can’t wait to read it!